Gina Haspel, the president’s controversial pick to lead the CIA, helped implement the agency’s torture program under the George W. Bush administration. A decorated 33-year veteran of the agency, Haspel ran a secret prison in Thailand where detainees were tortured, and later ordered the destruction of tapes of the brutal treatment. Her nomination, which comes after CIA Director Mike Pompeo was selected to take over as secretary of state, has drawn new attention to the agency’s stance on torture. President Donald Trump’s controversial nominee to lead the Central Intelligence Agency helped implement the agency’s torture program under the George W. Bush administration, a record that will make her confirmation process difficult and likely ugly. Gina Haspel, who joined the CIA in 1985 and spent most of her career undercover, oversaw the waterboarding and use of other “enhanced interrogation techniques” – authorised by the Bush administration and later outlawed by President Barack Obama and Congress – at a secret CIA prison in Thailand in 2002. On Tuesday, Haspel was nominated to become the agency’s first female director after Trump fired Secretary of State Rex Tillerson and asked CIA Director Mike Pompeo to replace him. At the Thai prison, known as a “black site,” that Haspel ran, two terror suspects were extensively tortured. One detainee, Abu Zubaydah, was waterboarded 83 times in one month and subjected to other dangerous treatment, including having his head slammed against a wall repeatedly. Interrogators ultimately determined that Zubaydah, who lost an eye during his CIA detention, did not possess any useful information. In 2005, Haspel signed a cable ordering the destruction of 92 video tapes of Zubaydah’s interrogations – a decision that became the subject of a lengthy criminal investigation by the Justice Department that did not result in charges. Haspel also helped facilitate the “extraordinary rendition program,” in which the US government handed detainees over to foreign officials, who detained and tortured them in secret prisons. Hundreds of terror suspects were tortured and abused by the CIA and Department of Defence in the years following the 9/11 terrorist attacks. And while the Bush administration’s program, which violated longstanding US and international law, has been widely condemned both domestically and around the world, no government official has ever been prosecuted for their involvement in it. Under Trump, it’s not entirely clear where the CIA’s leadership stands on the issue of torture. Pompeo has said that waterboarding and other “enhanced interrogation techniques” do not constitute torture. And he has defended intelligence officials and others who engaged in these practices as “heroes” and “patriots” simply protecting their country. Trump repeatedly expressed his support for torture, including waterboarding, on the campaign trail. Joe Raedle/Getty ImagesProtesters gather in front of the Supreme Court in January 2017 to mark 15 years since the first prisoners were brought to the US detention facility in Guantanamo Bay, Cuba. Human rights and civil liberties groups slammed Haspel’s nomination on Tuesday. The ACLU, which has engaged in extensive litigation concerning the government’s torture program, is pushing the CIA to declassify and release “every aspect of Haspel’s torture record” before she is put through the nomination process. But Haspel is widely respected within the agency and her promotion to deputy director earlier this year was praised by a long list of current and former intelligence leaders, including those who served under former Obama. 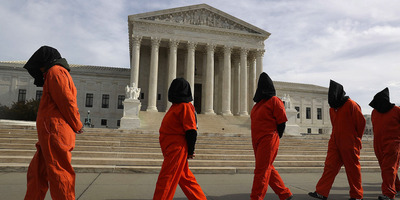 The widely-held opinion among agency officials and loyalists is that those who carried out Bush’s torture program were simply following orders. Former CIA Director John Brennan, who led the agency under Obama, praised Haspel as someone with “a lot of integrity,” despite her record, during a Tuesday interview on MSNBC. Haspel will face a difficult nomination process and what will likely be a bruising confirmation hearing given the many concerns about her record. Democratic Sen. Dianne Feinstein blocked Haspel’s nomination to lead the CIA’s clandestine service in 2013 over concerns about her role in the interrogation program and the destruction of evidence. And many called for her to be blocked from taking the deputy director position, despite the fact that the promotion did not require congressional confirmation. Republican Sen. John McCain, an outspoken opponent of torture, called on Haspel to detail her role in the torture program and clarify her stance on current law regarding torture.